If you have a trackball and a newer computer and video card, crayon physics deluxe is awesome, and the free demo has a ton of content. What I am really after is retro games like on mame but legal PC versions, such as compilations. I tend towards quality rather than quantity and have found the best I can come up with is the Microsoft Arcade series of games. and last but definitely not least....Microsoft Pinball Arcade. All the above seem near ideal although so far I haven't fully tested them I have only tried the trial versions of Microsoft Return of Arcade Anniversary Edition & Microsoft Pinball Arcade. I have bought both of these but they are coming from the USA so I need to be patient. To start with I went for Midway Arcade Treasures & Taito Legends 2 but when they came they were crippled by Starforce Protection and I couldn't even get them running on a normal PC let alone see if they are cabinet configurable. Sorry about the long post! http://www.gameofyear.com/download/JnGGoldDemoSetup.exe Its a fun game. List updated w/ recent additions! Keep them coming! Still using screenshots? Try EmuMovies instead. I have been wanting to add a PC Games Video set to my site, but never was really sure where to start, I think it will be safe to go off of this list for starters. Great Job! Just thought I'd post an update on my suggestions for compilations. I have now tested this, It works ok on a cabinet but you need a mouse/trackball input for games like centipede. I have now tested the full version of this and it works like a gem, you will need to program your IPAC to operate menus though. buttons you need available on the control panel are: Shift, ESC, ALT, Enter, F2, F3, F4, F11 If you don't want to pause or toggle fullscreen mode you could leave off F3 F4 & F11. The only slight irritation is Ms.Pac-Man plays in a very small screen even if you go fullscreen. I will let you all know how well Microsoft Pinball arcade works when it arrives, the trial version works great but full versions sometimes differ so I will post again after I've tested it. I am surprised theres not more interest in this thread, come on guys make some more suggestions for compilations! I have installed Microsoft Pinball arcade on my cabinet and it plays really well on it. I can highly recommend this compilation for anyone into Pinball. The game menu (a front end of sorts) can be navigated easily with the joystick & Enter. The game controls are fully re-mapable to whatever you want and the CD-ROM is not required if you do a full install. Its amazing the detail on this game, you can easily forget you are actually looking at a screen and not a real table. 9/10 from me, I would like to give it 10 but can't because the highscore entry needs a keyboard, not a big issue though as you can leave it as "player 1" and press enter. That looks like a pretty good remake Mazzmn, I might have to check that out tomorrow. anyone try any of these retro games out? Tried this one today, unfortunately it wouldn't run on my cabinet, even though I set the resolution correct. The screen went black and then it went back to the desktop. Oh well, never mind. Maybe the game needs Win XP, My cab has win 98se. on a side note, slightly off topic, how do you guys run games with different control panel configurations? I program my IPAC with the Ctrl+Alt+P command, but then if the next game I play is different controls then im stuffed again! You can install Doom Legacy (http://legacy.newdoom.com/) and set up a .cfg file to auto launch it without bothering with the main menu and set it to some basic joystick/button combination. Best part is that if you want, you can run it SPLIT SCREEN! Nothing better than playing co-op doom with a friend splitscreen. If you have any questions on the setup, just ask.. I use Mala as a Frontend, which has an option to set up a program to launch prior to your game, and then set the group to use to ipc file of your choice. Thanks for your reply, I haven't fiddled much with front ends I am trying to keep setup as simple as possible on my cabinet. I guessed I would probably need some sort of front end for multiple control layouts. Mine is very simple, I just have a Icon for each thing I want to run (4 Icons), I have the taskbar set to auto hide. Then a custom desktop background and tab and enter mapped to the control panel. All I do is press tab until one of the icons is selected, then change icons with the joystick and press my control panel Enter to run that game, jukebox etc. Its not fancy but it seems to work well on my cab. I like the Doom suggestion that would be a pretty fun game to have on a cabinet. I haven't tried it yet, but there's a game called "Bullet Candy" that looks interesting. It seems to be a sort of fusion between Geometry Wars and Ikaruga (or similar "bullet hell" games.) It's a pay-to-download, but it's only 4 bucks or so, so that doesn't seem too much of an issue. I only wish that I could find a game demo first. Plugged it into my Mame Arcade running Mala and everything works flawlessly. Much better than the DDR mame options, and adding music is easy. Very easy to find all the original ddr packs if you know how to use Google. If you are looking to make it a more authentic game you can even enable coins. Hyperbowl (Link to archive of original site) is awesome with a real trackball. The only problem is that you need to use the keyboard to enter player names, but I've learned to do this using the joysticks and buttons connected to my Minipac. Get Medieval (Link) is a great Gauntlet clone. There’s a level editor for it, too. I play the PC version of Golden Tee Golf with many addl courses. I also like Neverball (Link) and the kids like SpongeBob’s Obstacle Odyssey (Link). Fun little light gun games. Low graphics, but good to just flex nuts on the sweet LCD light gun you recently purchased. The House of Deads for the PC run absolutely perfect, and even have extra options for training, etc. Great 'bang bang kill you dead' games for sure. This clone is kind of new when compared to 'Frets On Fire'. But I like this one better. It gives a more Guitar Hero feel to it with combo stacking and what not. I haven't tried with a PS3 guitar yet, but I would like to assume it would work. If you like DDR, let me ask: What can be greater than every single DDR song ever made with an infinite pool of new songs that are being created every day. Go have fun and dance to the mario brother's theme or baby got back. Just get a PS3 mat or a PS2 mat + convertor and you're all set to boogie. Very good! List has been updated! If someone wants to tackle putting this list on the wiki that would be great! Cool, thanks for updating the list! Are you guys just talking about free computer games? Are you just talking about ones that can run on crappy computers? Are you just talking about games that do not require a CD to Boot up… because it is pretty easy to download load a crack .exe to replace your original .exe file that will no longer requires a CD to boot the game. On my dull core cab I have…. I have a lot more but I grow board of looking them up. Micro Machines V4 is a good one. The Eurocom version doesn't use the infernal copy protection that the "Midway Arcade Treasures Deluxe" version did. Only drawback is that it doesn't allow any multiplayer whatsoever, not even split screen (unlike the N64 and Dreamcast versions). Otherwise it's arcade-perfect, and still a ton of fun to play against the computer racers. Yes, Konami actually put out a PC version of the first DDR game. Plays perfectly with any console dance pad with the right USB adapter. Graphics are not quite as detailed as the arcade original, but it still plays like a dream on an arcade cab. Will run great under Windows XP with a little finagling (you actually have to reduce your color depth before launching the game, or it will complain). If your arcade sticks are interfacing with your PC as a keyboard, this game might give you a little grief because it only allows one player to use the keyboard as the controller. However, by using the PPJoy and PPJoyKey utilities, you can map keystrokes from your arcade controls to virtual joysticks that are recognized by the game. Fantastic PC snowboarding game. You can do stunts or just all-out race. Best played with analog controls but works great with switch-based arcade sticks too. GlobalVR turned this into an arcade game they called "Need for Speed GT". (http://www.arcadeflyers.com/?page=flyer&db=videodb&id=5949&image=2) It's pretty much the same engine - great arcade driving fun! This game was also given the arcade treatment by GlobalVR. (http://www.arcadeflyers.com/?page=flyer&db=videodb&id=5949&image=1). Again, great arcade driving fun. The arcade version of Star Wars Starfighter actually plays more like a rail-shooter (much like Sega's Star Wars Trilogy Arcade), but the PC/console version gives you freedom of movement. Brought to the arcade (Finally!) by Konami and Raw Thrills (http://www.rawthrills.com/game.php?GameID=14). The PC version comes bundled with a USB guitar controller. There's also an Aerosmith edition (http://www.aspyr.com/product/info/93). 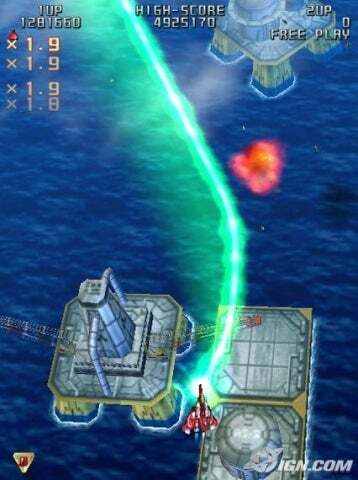 Can I suggest this Shmup that seems to be Awesome ? Good call on Virtua Fighter 2 PC. I picked it up for $1 and am pleasantly surprised. With all the video options maxed out it looks pretty close to the original. Plus it was easy to set up with my U360's. I can't believe the lack of bowling games.... they are perfect for trackballs! I haven't tried these so if somebody could confirm or deny whether they work well with a trackball I'd appreciate it as I'm still in the design part of my system. I should have it set up though by late august, early september. Excellent game for a cab, customizable controls, runs excellently on my old raiden 9700 mobility 64mb. Its 3D and similar to Raiden II, very addictive! Music pumps you up, fitting for the camera because you're zooming over landscapes everywhere! (Sorta like Ikaruga). Runs very nice on my Monitor 640x480i! (Has an option to rotate screen CW or CCW 90 Degree's, or 2 different types of horizontal views). its 2 Player as well. Ooooh...that looks sweet! Time to track down a copy. Got my Raiden 3 CD. Outstanding! Gameplay, sound, and graphics are excellent. And it works great on my cabinet. Nice find. The games shouldn't need to use a mouse pointer to browse through menus or play the game. Using a track ball for games like Hyperbowl should be ok. The keys should be remappable to custom control panels. It also shouldn't need a CD. does raiden III support 320x240 resolutions? How do you download these games? Do you have to create an account?